d'Anelli Bridal > Trunk Shows > Wilderly Bride – Designer Show! Wilderly Bride – Designer Show! Wilderly Bride, a collection for the elegant, free-spirited bride, is featuring its debut Spring 2019 collection at our store! Be the very first to see this amazing collection! Price Range: $950-$1,300. Book your appointment today! 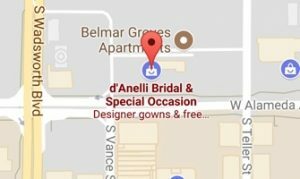 *d’Anelli Bridal is by appointment only. However, please feel free to call ahead to check for same day visits.